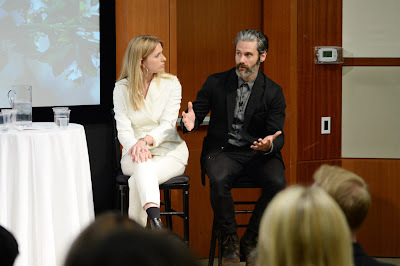 Loomstate co-founder Scott Mackinlay Hahn was recently on a panel hosted by Vogue and H & M on the future of sustainability in the fashion industry. The stellar lineup of eco-concious moguls included Ecouterre editor Jasmin Malik Chua, designer Bruno Pieters, former Barney's fashion director Julie Gilhart, as well as members of H&M's sustainability board. Moderator Simon Collins, Dean of the School of Fashion at Parsons, kept the discussion grounded. Wash your clothes in colder water and line, or at least tumble, dry. Recycle your clothes (by donating or reselling) so that they don't end up in landfills. Buy higher quality items that will last longer. Mend things when they fall apart. Send more suggestions to @Loomstate_Org!